Of meeting your perfect match Online. in attracting your soulmate or not. A professional "gently" retouched online dating photo will show off your BEST SELF! with "just enough" retouching to remove distractions will boost your chances of getting noticed. Craving that "Head Over Heels" feeling? Hollywood's cliche depiction of a man and woman falling in love on the silver screen has perhaps jaded the perception of romance for the modern day single. Harper's Bazaar brought together a collection of "The 14 Best Movie Meet-Cutes." (Click here to see movie clips.) This collection of memorable movie moments feature famous couples performing their ritual mating dance while we all wait with baited-breath as the two awkward stars deny their mutual attraction for each other. We all know they will ultimately fall in love and we leave with the thought, "only in Hollywood." It offers us a two-hour respite; a mental reprieve from our own reality. We all could use a little help on our journey to find our true soulmate. In 2017 online dating became a $3 billion dollar industry. As of January 2018, 49 million people have tried online dating, and Statistic Brain's research shows 20% of current committed relationships started online and 17% of couples who married within the last year met on a dating website. In our social media-driven world, cutting through the volume of online dating sites, the "swipe left...swipe right" mobile apps, and the myriad of profile photos bombarding the modern-day single, we all may welcome a little dating assistance. My goal as a photographer and an experienced retouch artist is to help you with your online dating profile photo to give you a little assistance in the overwhelming, online dating world. I want to help you look like the best possible "YOU". Many try to take their own selfies or hand their cell phone over to a friend to try to capture you in the best light. This article outlines all the mistakes you might be making on “How Lighting Changes What You Look Like”. Understanding lighting, pose, expression and post-production of a photograph takes years to hone and perfect. Retouching has been given a bad name by those who have overused the features and don't understand the visual nuances of "subtle" touch-ups. Untrained retouchers or amateur photographers often pull out the stops and create an online dating portrait akin to a phony, plastic-looking doll giving the industry a bad name. Just as it is not a good idea to post a ten-year old photo of yourself, it is also not a good idea to post an "overly-retouched" image of yourself. When you arrive at that first date, you want to look like who you are. There is a balance between that speed it takes to impress someone online with an amazing photo, and an over-done photo that doesn't really represent YOU. Research shows that you have 1/10th of a second to make that brilliant first impression. You may ask, "If I only have a split-second to get noticed, and an 'overly-photoshopped' photo will get me rejected, how do I resolve this dilemma?" of a natural, yet, professional Dating photo. Proper lighting and gentle enhancing in Photoshop can make your eyes sparkle so your features shine. 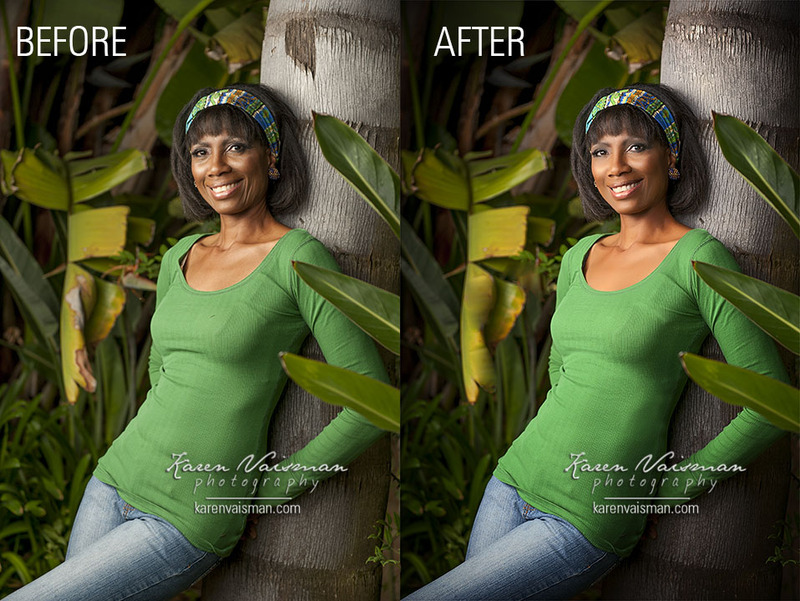 Karen Vaisman Photography offers professional retouching that embraces the fine balance between "enhancing" your look with Photoshop without completely overdoing it. You want to show your true self; that sparkle in your eyes while removing distractions (stray hairs, under eye circles) but still reflect warmth with a welcoming smile. Professional retouching by Karen could make the difference between that 1/10th of a second, research shows, is all it takes to get passed over and having that special someone actually stop, take a closer look, and then contact you! Same person- same clothing. Lighting, angle, professional photography, and retouching by a pro will help you stand out and get noticed! Do you still want to use that mobile phone photo to meet the person you want to build a relationship with? Gentle enhancements make a difference. Researching what to do and not to do in online dating photos can be daunting. Online dating is similar to an audition to connect with someone you don't know. The most important thing is you need to be YOU. Feeling comfortable and approachable in your online dating profile photo leaves a great impression that will carry through on your first date. I have compiled information gathered online from articles and research. Feel free to click on the links to read further. What I can conclude from all my years as a photographer is that eye contact in a well-lit and naturally-posed photo matters. Finally, putting on the finishing touches in Photoshop, expertly done in a subtle way, raises your image to the next level. Professional enhancements in Photoshop that do not change your "look" but still keep your image "natural" will increase your chances of getting noticed. Take a look at the photo below of the blonde woman with a ponytail. Look in her eyes...a crescent-shaped reflector added a semi-circular catch-light that added a bit of "sparkle" to her eyes, making them playful, flirty and twinkle with mystery. This is the type of tiny detail a professional studio photographer knows, which is not obvious to most viewers. It helps add that extra "magic" to the photo. Pose showing your interests (most popular – yoga, surfing, general athletics) also – health, food, family, dancing, and art. Smile with teeth and great eye contact (show happiness most attractive to men). Flirty smiles = great results. If you love sports – pose in your favorite sports team jersey. Show off Left side of your face! Men prefer not to see tattoos on women. Don’t overdo your makeup, be natural. Don’t use group shots (it adds to the confusion) and your friend might be more attractive than you! Don’t pose with a pet, if you are a woman. Wearing red is recommended, not blue, green, yellow, white, or black. Pose with great eye contact to the camera. Pose showing off your interests (most popular – surfing, yoga, skiing, the ocean). Pose outdoors (especially for gay men). Show off abs (if you have them and you are under 30). Pose looking “proud” (most attractive to women). Also described as “head tilted up, expanded chest, and arms raised above head in fists”. Wear dark blue or black (particularly a dress shirt). Don't pose in a way that may seem threatening to women (avoid covering eyes with sunglasses, avoid hats). Professional Online Dating Profile Photo? Isn't a professional photo sending the wrong message? No! Would you go into a job interview without combing your hair or wearing wrinkled clothing? Presenting your BEST self, in the best light will get you noticed! If you post a blurry, dark, low-quality cell phone image, how do you expect to be noticed? Make the decision to change your life and meet with me. You will see it will be fun! I can help you feel confident and comfortable so you can relax and just smile. People will feel like they almost "know" you, by looking clearly into your eyes. I take my photos, with my camera attached to an iPad. This allows you to see the photo immediately after it is taken. How amazing is that; to have immediate feedback on how you look? We can then change the pose or the expression and move on, building your confidence as we go. You can post this great shot after I have gently retouched it to show off your best features without changing your personality. Your eyes will sparkle, your smile will be genuine and suddenly the spotlight will be on you! I can take my own photo, it will look just as good. - Hmm. I suspect that is why you are reading this website. Well, most people have tried to do just that (the mirror "duck face", the wide-angle unflattering selfie, the "in the mirror" shot) and that is why they get lost in the piles of online dating profiles without getting noticed. I am guessing you have already tried that...and that is why you are tired of staying single, and you have read the website to this point already! Lighting changes the way you look as this article illustrates. Trying it yourself is brave, but may not be fruitful. I am not trying to convince anyone not to take that route. As a matter of fact, I think it will help your profile to post a mix of both professional and candids to show a full selection of who you really are. I am confident my unique blend of artistic skills, both photographically and as a retouch artist, will keep you looking true to your personality and the best you can be! The secret to a great photo is what happens behind the camera, the conversation, the fun, the interaction that results in those amazing expressions. This type of natural rapport is kind of hard to do by yourself or with an amateur photographer who does not know how to react quickly to catch the moment in the right light. Working with me will provide you a great opportunity to create an amazing profile photo to help you meet Mr. or Ms. Right! I can help you capture your intangible inner sparkle… Don't take my word for it, read my 100+ 5-Star Reviews on Yelp and Google. I don't want a "Glamour Shot". - I wouldn't recommend that either. Our goal will be to discuss who you are and who you want to meet. You don't want to put on a show and then end up with the wrong type of match. I've read that many women want to get responses so they may show a bit too much cleavage. They get responses - (too many in fact!) but are those the type of men you want really meet? We want to target your "look" to match the person you ultimately want to end up with. That takes discussion and understanding. We will then move forward with a portrait design session to talk about clothing, props, colors, hair, nails, makeup, location (indoor, outdoor, studio) to make a plan for what suits you best! I do have makeup artists and hair stylists available if that is what you want, I can also guide you on makeup and hair if you would like to do it yourself. I look terrible in front of the camera. I'm not photogenic. I get very uncomfortable getting photographed. - Whew! I'm glad you got that out of the way! Over the last two decades shooting in Los Angeles, if I had a nickel for every time I heard that! I know the "fear" can be very real. Thus the "need" for a professional who makes you feel at ease! That is 90% of my job because if I can't get you to relax and feel happy in front of the lens then I shouldn't be doing what I do. I'm passionate about making YOU look the best you can look! Please read my reviews to see what hundreds of my clients have shared. After that first picture shows up on the iPad as I take your photos, you will immediately relax and know the rest of the images will be as good, if not better! We will have a great time together and you will leave with amazing online dating photos, the first step in meeting that very special person! I'm so busy, I don't have time for this self-indulgence. - Well, no one knows better than you what suits you best, but I reiterate, you are reading this website for a reason! Not to worry, our session is 30 minutes to shoot, 30 minutes to select. In an hour you can put it all behind you...but trust me, it will be a fun experience and a great memory AND the results will pay off, giving you a much better chance to rise above the rest to meet your special someone! The new study involved more than 600 people and a range of experiments. In one trial, participants were asked to indicate the likelihood that images of their own face, and images of a stranger’s face, would be used as profile pictures on social networking sites such as Facebook, dating sites such as Match.com, and a professional site such as LinkedIn. Other people recruited via the internet then assessed these photos for social traits such as attractiveness, trustworthiness, dominance, competence and confidence. The study showed that people were able to select images of themselves that accentuated the desired characteristic for a site, such as attractiveness for a dating site and professionalism for a work site. However, the self-selected images were rated by the internet recruits as giving less favourable first impressions than the images chosen by strangers. “One explanation could be that we perceive ourselves more positively than others do, in general. This may interfere with our ability to discriminate when trying to select the specific photo that gives the most positive impression,” says Dr White. Fortunately, included in my session, I spend 30 minutes helping you select your best photo(s). As a subjective outsider you have the benefit of gaining my professional opinion and guidance! you want to use to compliment your professional portrait that we will review them together. The color scheme of dating photo. Location of the portrait (studio or outdoor). If in studio, what type of background compliments your look? Do you want a full body, 3/4 body or headshot. Length of session based on the number of "looks" and locations. Click here to find out more session details. I have a Bachelor of Fine Arts in Photography. I'm known throughout the Ventura County and Los Angeles area as Conejo Valley's Premier Portrait and Headshot studio. Please visit my before and after gallery to see samples of my retouching work. All the images in the gallery above have been professionally retouched. in an online dating photo! I have perfected my skills as Los Angeles and Conejo Valley’s Professional Portrait & Headshot Photographer for over two decades. I have worked with many singles who need online dating photos. It brings me so much joy to know I'm helping people. I am confident you will love the results of our portrait session! I'm proud to share over 100+ 5-Star Reviews from my clients on Yelp - click HERE. See more reviews on Google HERE. Find out more about my professional headshot sessions here.